Sometimes even the smallest devices provide the greatest amount of protection for your plumbing system, home and safety. 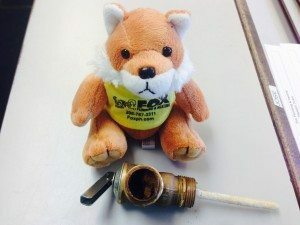 Recently, a Fox Plumbing & Heating professional discovered an improper installation in Auburn that could have jeopardized their home. Learn more about your Temperature and Pressure Relief Valve in ‘Tips from your Neighborhood Plumbing Professional’ below. Temperature and Pressure (T&P) Relief Valves are installed to help detect high temperatures and relieve pressure that can build up within your water heater, providing a short-term solution and preventing long-term issues to arise. The T&P valve is designed to start discharging water relieving pressures at 150 psig or 210 degrees Fahrenheit. Since they are installed as a safety measure, if the T&P valve is discharging water, there is an abnormality it is remedying in your system. Basic science tells us when water is heated, it expands. A standard 40 gallon water heater, operating at its set thermostat, will expand by roughly one-half gallon. If the added volume doesn’t get relieved, then pressures will start increasing dramatically. Thermal expansion is easy to diagnose. If the T&P valve releases roughly one cup of water for every 10 gallons of heater capacity within one cycle, thermal expansion is your culprit. And thermal expansion tanks are REQUIRED in most of King County. Remember, the T&P valve is installed to provide a short-term solution. Regular discharge from your T&P valve can create mineral-deposit buildup on the valve seat, rendering your valve inoperative. If thermal expansion is causing your T&P valve to overwork, you might consider replacing the valve and installing a Watts thermal expansion tank as a long-term fix, as this is required by the current plumbing codes. Still got a leaky T&P valve after installing the thermal expansion tank? Try installing a Watts pressure regulator on the incoming water line. Excessive pressures (above 75 PSI) require extra care. Like most equipment, there is a wrong way to install the right fix. Not only will incorrect installation cause a breakdown in your water heater system, it also puts your safety at risk. To ensure proper operation of your T&P valve, the temperature-sensing element needs to be immersed in the water within the top six inches of the tank. Additionally, they need to be installed in the hot outlet service line, or directly in a tank tapping. They must be isolated from flue gas heat or other ambient conditions. There’s a reason for the warning tags on your T&P valve; the discharge exiting the valve can be scorching. The T&P valves must be installed with the discharge line piped downward to a sufficient drain or outside location. This method reduces the potential you will have to touch it and get scolded, and protects the property from damage. 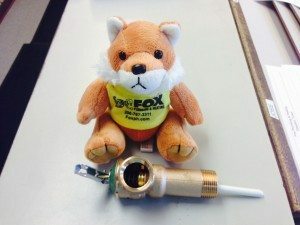 If you are concerned about the current installation on your T&P valve, contact your local plumbing professional at Fox Plumbing & Heating. Our plumbing professionals can help diagnose minor problems before they grow, and ensure the safety of your family. Thanks for sharing such an great post its really knowledgeable and skilful. thanks for sharing such an nice post with us.